A large and fabulous Chinese carved, lacquered and painted wood architectural model of an ancestral hall, Qing Dynasty, 18th century. The ancestral hall architectural model set on a raised foundation and featuring a stunningly detailed hip and gable roof of undulating form overhanging an outer terrace. The large support pillars lacquered a brilliant Vermillion red, some with Chinese couplets and new year wishes attached. Another set of support pillars frame the interior chamber which has been stripped. The interior would most likely have housed ancestral tablets, also known as spirit tablets. The exterior of the the hall and terrace black lacquered and etched to produce the illusion of brick work. A large portion of the lacquer to the front of the terrace missing, with minor losses to the exterior side walls as well. A pair of large makara dragon fish decorate both ends of the main roof beam, with a further pair of dragon heads descending down the sloped roof. Under the overhanging eave of the roof, the architectural and decorative dougong (CAP and block) interlocking brackets are visible. Both the dougong and surrounds painted with a beautiful traditional Greek fret leiwein (rolling thunder) and billowing cloud pattern. Originally brightly painted, now somewhat faded, with traces of the brilliant turquoise and ochre colors still visible. Ancestral or clan halls were an important part of Chinese culture and identity. They provided a place to gather and celebrated the heritage of a shared lineage. The halls usually named for a family surname, and were meant to honour all those who came before that shared that surname - a form of ancestor worship and reminder of filial piety. This model is almost certainly a model of an actual hall, and would have been used as a substitute for a family or community of the Chinese diaspora far removed from their ancestral home. In very good condition for age, with some loss to the lacquer brickwork facade. The paper couplets and inscriptions with loss as well. Fading to the painting. 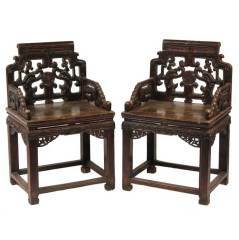 Impressive late Qing Dynasty Chinese daybed from Hernan, China and was made from elmwood and bamboo. 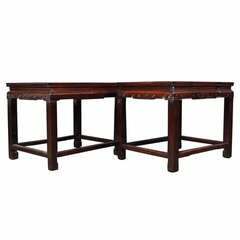 The piece features traditional mortise and tenon joinery. Wrought iron architectural compass from Kingston, NY with brass nutt and bolt, circa early 18th century.